Spinach is the perfect way to green-up your summer menu. Unlike many leafy greens, spinach is sweet and easy to use in any recipe, which is why it’s so popular. This recipe is perfect for the whole family. It makes a lovely holiday meal that is a quick and easy anti-inflammatory breakfast. It is also a perfect appetizer. Cut into 2-inch x 2-inch bites and serve! Preheat the oven to 350° F. Grease a 10 by 14-inch casserole dish with the olive oil and set aside. 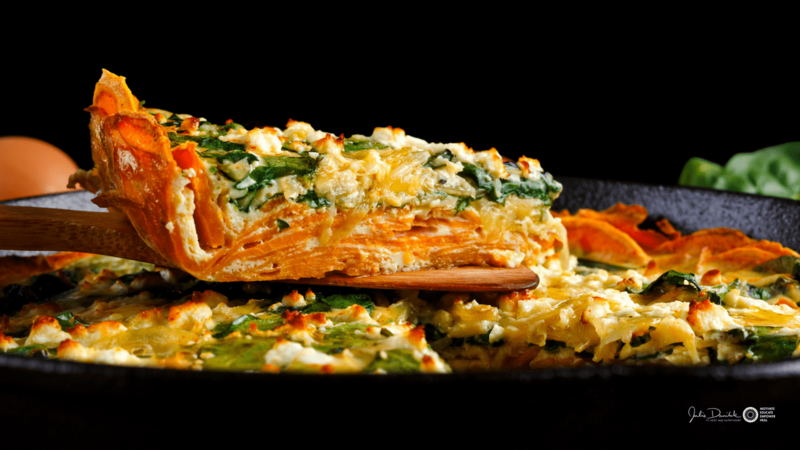 Layer onion, spinach and sweet potato in the bottom of a casserole dish. Whisk eggs, water, salt and pesto in a medium-sized bowl until well blended. Pour mixture over other ingredients in casserole dish. Top with fresh chopped herbs. Cook for 30 minutes or until the eggs are set. Makes 6 servings. Recipe reprinted with permission by Julie Daniluk RHN and Random House Canada / ©MealsThatHealInflammation2012.